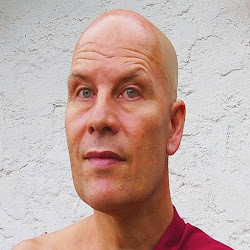 Bhikkhu Samahita is originally from Denmark. He was a Medical Doctor and an Associate Professor, before ordaining as a bhikkhu. He currently resides in Sri Lanka and is a bhikkhu of the Theravada Forest Tradition - Arannavasin. He arrived in Sri Lanka 2001, was ordained as novice at Maharagama Bhikkhu Training Center 29th January 2002 by the late Ven. Madihe Paññasiha Mahanayaka Thera and fully ordained as Bhikkhu the same place the 5th July 2003 by Ven. Ñāna Ratana Mahanayaka Thera. He meditates mostly alone in a remote mountain forest hermitage in Bambarella, near Hulu Ganga, Panwila ~ 56km from Kandy. Daytime visitors are always welcome. Over-night accommodation is available at small meditation-center nearby. He operates several online groups for spreading the teachings of the Dhamma and maintains a website with a wealth of material on the Dhamma by other members of the Theravada Sangha. It would be good if any Ven. Sir or someone having contact to fellows, his preceptor or teacher, knowing any afflicted Sangha in his near, out of compassion, or out of duty, would look after him and urge him to live with a teacher and the community and how urges him to give up his improper ways and livelihood. (Toward supporter generally: Do in no way support a monks isolated dwelling in ways like daily food support, with money, and so on, so that he lives merely independent, without require of contact to teacher, preceptor or/and daily alms round. Remote living ordinary people, when not having reached a firm and good level, are subject of developing all kinds of views and confusions. And such as spirits are also a matter that should not be underestimated, living in forest, probably total unprodected by right practice. An email has been written (and failed...), but Asians are not so used to read and communicate aside of telefon or facebook. Personally would be always the best since all new medias are regarded as game and not serious, no cause and effect. Sms's have been send to his Monastery and to him as well. He has really serious problems... and they are not outwardly of him and his actions. Since in Sri Lanka, maybe Ven. Nyanadassana , Nyanatusita Bhikkhu , Chandaloka , Anandajoti Bhikkhu , or Nyanasara Thero may have possibilities to care. It is possible that he go serious ill and is under fiber, mental possessed but of course has it's kammic reasons possible already led him to loose mind totally. Close friends whom he would listen to, who are skilled would be required. Or a jacked to be closed on the back, if such is not avaliable, to get treaded to know mind and body again. How ever, is having possibility to reach out for teacher or fellows, it would be good if not living "independently" and on improper relation with housholders. So if anybody would have certain authority for him, meaning that he has strong affliction toward anybody (and this can be of course the "pressure" of his whole community), it would be good to make use of this "power" to move him to get next and near fellows. Also good if Brahman David NS would try to share some mercy and signs of obligations and share it within his community. Of course giving is something that is a matter of free will, as not giving and taking or oppressing, depriving or tactics are, for (from) a good or bad. Bhante will be most of the time be possessed and only sometimes really reach able. If someone is near him and of own good condition, able to bear strange things, it would be good to take care on Bhante. Note, that "he" would be not always trust-able, since not alway present. If knowing a good monk with good relation to him, try to bring him, them next to him. Dwelling in the forest is either physicla and mental dangerous if not best trained and bodily weakened. You as well as him my underestimate the many beings around and to break it down just on physical matters would be not sufficent. Even if moving from that place, certain guest will follow. Note: If you are an ordinary person and also not skilled in treading such cases and not a very close and respected friend, your best help would to send good wishes and if having possibility to reach out for people who could assist. All other ways might be more contra productive and nurish the wrong. (It's of cource good time to care about your self, practice and see throw for your self) Only seldom one might be able to share best for someone else good support at the right time. So nothing that requires to blame your self if good intentions might not be receiveable by others. My person wrote an email to them so far, that it would be good to bring Bhante to a proper place where knowledgeable can take care of him. As it was told via his FB-account "Am save and sound back in Denmark...continuing from here. May it be of benefit for many, althought it deprives him even more of the capacity of the Tripple Gems for his welfare and was a little fast, so that it must be assumed that not all went really in proper abd good ways. Well then. Sadhu for those having supported with good and skilfull intention and best possible ways. Just saw that his father, sick, asked him to stay with him, as he answered a question. That a reason, proper, to pause ones training or reduce for a while. Blessed if having a wise father and blessed if listening on such. Mudita.